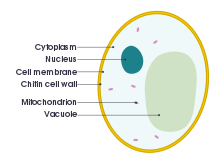 Baurms are eukaryotic, single-celled microorganisms classifee'd as members o the fungus kinrick. Bi fermentation, the baurm species Saccharomyces cerevisiae converts carbohydrates tae carbon dioxide an alcohols – for thoosands o years the carbon dioxide haes been used in bakkin and the alcohol in alcoholic beverages. ↑ Legras JL, Merdinoglu D, Cornuet JM, Karst F (2007). 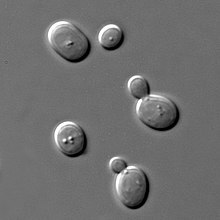 "Bread, beer and wine: Saccharomyces cerevisiae diversity reflects human history". Molecular Ecology. 16 (10): 2091–2102. doi:10.1111/j.1365-294X.2007.03266.x. PMID 17498234. This page wis last eeditit on 20 Apryle 2017, at 01:20.